For the first time, this deluxe visual history treats Peanuts fans to an in-depth look at the art and making of the beloved animated Peanuts specials. From 1965's original classic A Charlie Brown Christmas through the 2011 release of Happiness is a Warm Blanket, animation historian Charles Solomon goes behind the scenes of all 45 films, exploring the process of bringing a much-loved comic strip to life. The book showcases the creative development through the years with gorgeous, never-before-seen concept art, and weaves a rich history based on dozens of interviews with former Peanuts directors, animators, voice talent, and layout artists, as well as current industry folk. 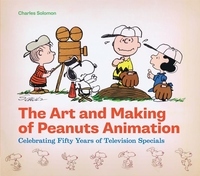 Filling a void in animation publishing--there is no other history or art book of the Peanuts specials--this volume celebrates five decades of the artistry and humor of Charles M. Schultz and the artists who reimagined the comic for the screen.